« Jim Doyle Signs Worthless Piece of Paper with U.K.
What about Mike Huckabee as Sen. McCain’s running mate? Politically it’s not a horrible idea. A potential plus with Huckabee on the ticket would be his ability to generate earned (free) media. He ran for a long time on a tiny staff and little money. McCain’s fundraising has been pitiful. The personable and tireless Huckabee would stretch out the limited funds McCain will have until he gets his public funds for the fall general election. Another plus is Huckabee might inject some life into McCain’s eCampaign efforts. After Rep. Ron Paul I think his campaign did the best job activating his online grassroots supporters. 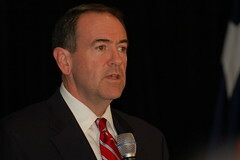 Huckabee talked directly to allied webloggers; the campaign used a real-time counter for fundraising, highlighted user-generated videos, and pushed people to the activist forum Huck’s Army. What would be most beneficial to McCain would be Huckabee’s ability to shore up the Christian conservative vote. Such a pick would take advantage of the identity politics displayed by them this season. Those who thought it was the social/Christian conservatives’ time to lead the GOP would be pleased with the #2 slot. At the same time it would alienate economic and libertarian conservatives who despise Huckabee’s Arkansas tax hikes and his nanny state pronouncements. And let’s not forget about border security conservatives who would be irate with a McCain/Huckabee ticket. And that’s counting Huckabee’s conversion/pandering. Another downside to Huckabee would be the close scrutiny Huckabee would get from a unsympathetic MSM. Huckabee enjoyed the same lack of vetting that Sen. Obama has recieved. What the media and opposing campaigns failed to point out was Huckabee’s dark side. While governor of Arkansas he had a habit of holding grudges and inflicting revenge on political enemies. That’s a 180-degree contrast with his national media brand of God, sunshine, populist emoting, and smiles. Huckabee’s shine would vanish once reporters started digging into his Arkansas record. I can understand the anger that would be generated with Huckabee on the ticket, but voting for Sen. Clinton? Yeesh. I’d rather vote for Bob Barr. We’re seeing McCain trying to build a different coalition. He’s pushing global warming to get some young voters and swing voters. At the same time he’s not reaching out to the conservative base and isn’t generating excitement with the business donors. By choosing Huckabee we’d see McCain going along with Ed Rollins’ claim that the Reagan coalition is dead. It does prove the Right needs to rethink how it approaches government and politics to win elections and advance limited government. This entry was posted on Tuesday, May 13th, 2008 at 3:36 pm	and is filed under John McCain. You can trackback from your own site. Lately it seems like all we do is argue. But this is a horrible idea. Chiefly, there’s no quicker way to fade in the polls than to make the ‘party of progress’ look like it actually is, compared with your old white guys who have nothing in common except they both want to be political top dog. It won’t only be the MSM who are unsympathetic. Huckabee brings the wrong numbers in inverse proportion to the numbers he’ll repell. Please no. There are so many much more qualified, and conservative, candidates. Taxabee would make a bad ticket even worse. Matt, I don’t want Huckabee as VP either, but I wanted to lay out a case for why McCain would pick him. I’m becoming more challenged with McCain by the day. I don’t know how much tighter or longer I can squeeze my nose. If he chose Huckabee, that might put me over the edge. Actually, Barr is beginning to look good in that Ron Paul until he takes the hard turn right off the edge, kind of way! I’ve said it before elsewhere–the McCain/Huckabee ticket just sums up this election cycle for me. I’ll still vote, but this will require a vice grip instead of a clothespin. Cry, America. If McCain picks Huckabee as VP, the GOP is history. As it is I’m trying to get used to the idea of yet again going to the polls on the first Tuesday following the first Monday in November, holding my nose and as I have every Presidential election since 1988 and voting for the lesser of evils! I’m not sure that John McCain with Mike Huckabee as his running mate would be that lesser of evils. I might have to stay home, or worse. I hope this ia not so. Two moderates running against two liberals. What about the true conservatives (not Huck-a-bots). This truly makes me ill. My only hope is that Fred will change his mind and be McAmnesty’s running mate. I agree with you all–of all the possible combinations to run with McCain, that of Huckleberry is the least palatable, i.e. the very worst choice for the USA. It is one thing to hold one’s nose, and quite another to loudly throw up in the voting booth. Please, please protect us from such misery and horror! It is time for conservatives to speak up. Why would McCain “pander” to moderates and evangelicals and ignore the millions of true conservatives? Is he afraid of us? Can it be that professional politicians do not see reality? We need to fight socialism at every opportunity, in order to preserve our republic. We don’t need to cave in to the UN or to unproven global warming nonsense or to taxing the wealthy to cover the burden of socialistic programs which will stifle the entrepreneurial spirit of the USA. Sean, do you know how to contact Fred Thompson? We need Fred to have a serious sit-down with McCain to explain some basic conservative principles. We need an advocate. McCain needs to fully comprehend all of our conservative concerns — secure the borders, no amnesty for illegals, solve the illegal alien problem through enforcement of existing laws and attrition, tax cuts result in higher revenue, a smaller federal government, “global warming” is a cycle largely caused by solar activity; and, why should we submit to measures designed to destroy the USA economy? Fred Thompson had solid and well-thought-out principles and plans. If McCain would embrace those principles, largely Federalist positions, there are many conservatives who would feel far more at ease with this candidate. If he continues his path of arrogance and “I know better than the rest of you” attitude, he will have a tougher-than-necessary battle this fall. It’s time for him to listen to us! True conservatives know that Huckabee will add nothing to the ticket. He is not a conservative. He didn’t govern conservatively. We are not mindless people who will “follow the party line.” No. No way. McCain cannot win with just the votes from evangelicals and moderates and unhappy Democrats. He needs us — and he better realize that soon. We need a real conservative and McCain isn’t and Huckabee is too changeable and not a conservative. People keep saying he will draw in the evangelical Christians, but all of them I know do not trust him. I am one of those. Remember Jimmy Carter! He pretended to be conservative and he gave away the Panama Canal and did many other dumb things. He is an embarrassment to our country still. Please ask Fred Thompson to reconsider!! McCain is looking to win an election, he obviously is just paying lip service to conservatives… He is more interested in the numbers of moderates, independents, and liberal leaning green rebublicans to bother with us… I loved his CPAC speach but that is the last attempt I know of where he tried to heal the rift. I suppose that “IF” he thinks that Huck would pull more folks to his camp he will do it. Personally I think that Huck is creepy, too much of a preacher, and not enough of a Conservative. Yes he would make a good comic relief sidekick for McCain who does come off a bit on the dry side, but other than that I see no need for him to be on the ticket! That said I would still have to vote for him over either of his Democratic rivals. To quote the lady above, ” We need to fight socialism at every opportunity, in order to preserve our republic. We don’t need to cave in to the UN or to unproven global warming nonsense or to taxing the wealthy to cover the burden of socialistic programs which will stifle the entrepreneurial spirit of the USA. Please go back to the principles of the “Contract With America” before you all mess around and lose the whole shootin’ match. Our country is turning into a bunch of “politically correct” mindless wimps that will not stand up for the principles upon which it was founded. I have to agree with Kathy, Sean is there any way you can contact Fred and ask him to have a sit down with John, & have a chat? or to get involved with the GOP leadership to give them a few hints about federalism & conservatism and how it would help the party. Thanks! OH me OH my!!! Where is Senator Thompson when we REALLY NEED him. I believed LAST year that he was the only candidate who REALLY UNDERSTOOD the ESSENTIALS of our Government and it’s purpose. What has happened to Security, Unity & Prosperity? How can we Support our Troops, yet NOT Secure our BORDERS. Our Party is in a turmoil and the country is FAR from UNITED. Our Prosperity is being outsourced, and us middle class working stiffs are supporting a whole society thru Entitlements and taxation. The FUTURE of OUR COUNTRY is at stake here. With McCain (God Bless him for his Service & War Hero Status) and Huckabee on the ticket, we are surely NOT considering what is BEST for the FUTURE of this COUNTRY. What has happened to the ETHICS of the REPUBLICAN Party? We are catering to the whims of the MEDIA and the pollsters who say Conservatism is dead. If we keep going in ths direction, our Obituary will soon be written. We are truly at a “Crossroads”. I said that last year, and I believe it MORE now. Our Forefathers feared the demise of this expiriment called USA. They TRIED to BUILD safeguards into the Constitution& the Bill of Rights. We were to be a Democratic REPUBLIC, but we seem to be losing our way. Do we want to become a Nation of the WORLD, or do we want to remain a Sovereign Nation? I am ranting —I am FRUSTRATED—I just see Huckabee as the VP being the FINAL NAIL in the coffin of this ONCE GREAT Political Party. I have seen the demise of the Democratic Party which has become basically Socialistic. I don’t want to see the Republicans doing the same. Perhaps it really is time for a FEDERALIST PARTY?? AND PLEASE Senator Thompson—HELP us!! A bad ticket gets worse! I’ll do like I just did for the primaries and “write-in” Fred Thompson. What happened to the principles of the Republican party? ?